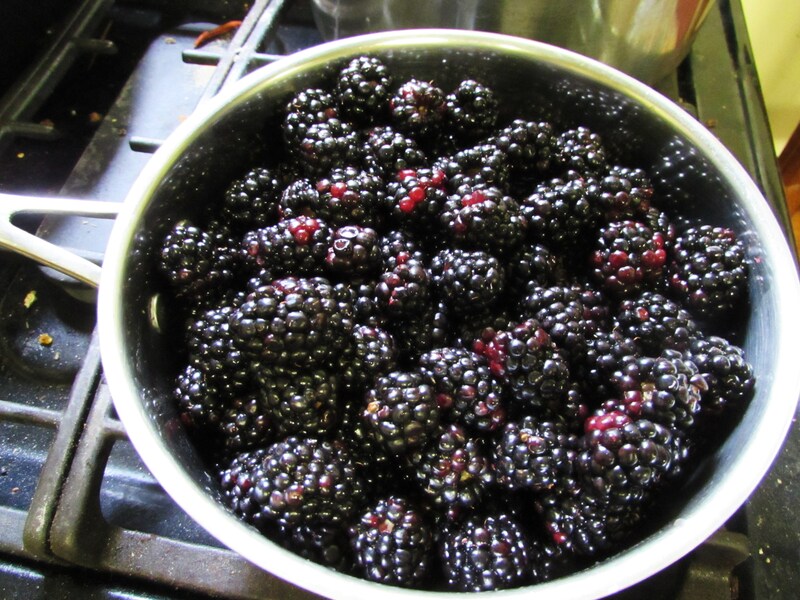 What is better then fresh blackberries? Fresh blackberries that your mom picked for you! This is exactly what my darling mother did for me and I promptly turned the gift into a cobbler whose future included vanilla Bluebell ice cream. Within 2 hours the cobbler was no more. I have found with a ravenous husband and a teenage stepson in the house, leftovers…..well. They are extinct. But that is okay! Heaven knows I don’t NEED any leftover cobbler! As a matter of fact I was going to get a pretty picture of it in a blue and white bowl with Bluebell on top and some cinnamon sprinkled about. They beat me to it. 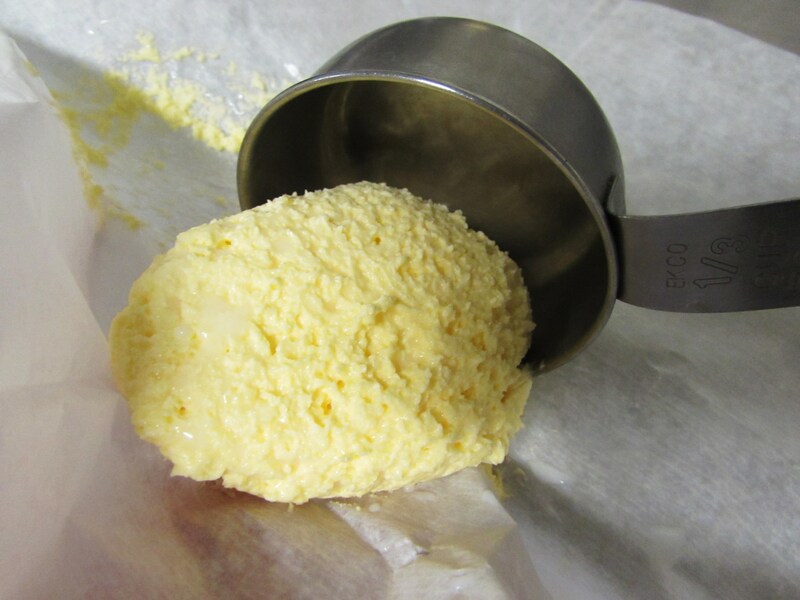 All good things begin with butter. Amen. I am a crust purist. I have never bought a crust in a store. If you have that’s okay. We can still be friends. 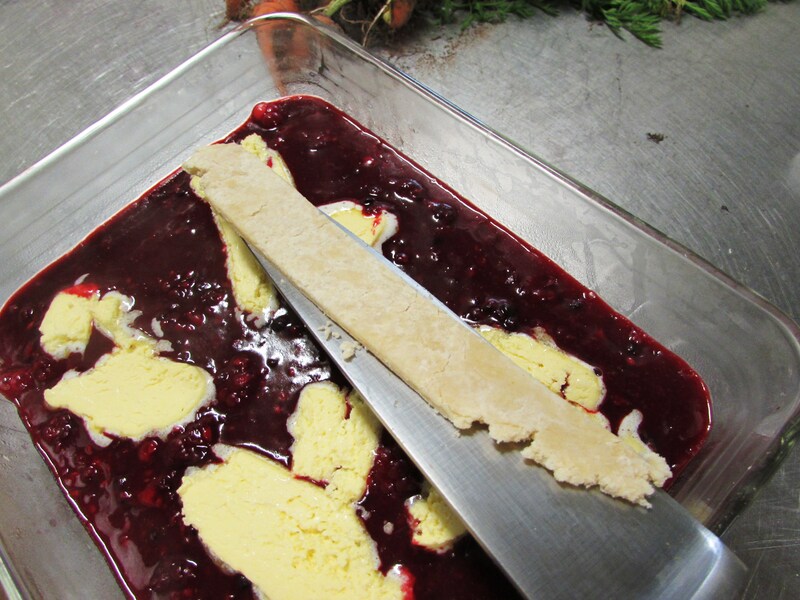 So before we even start addressing the lovely pile of berries in our bowl we must get a double crust recipe ready to roll. Literally. 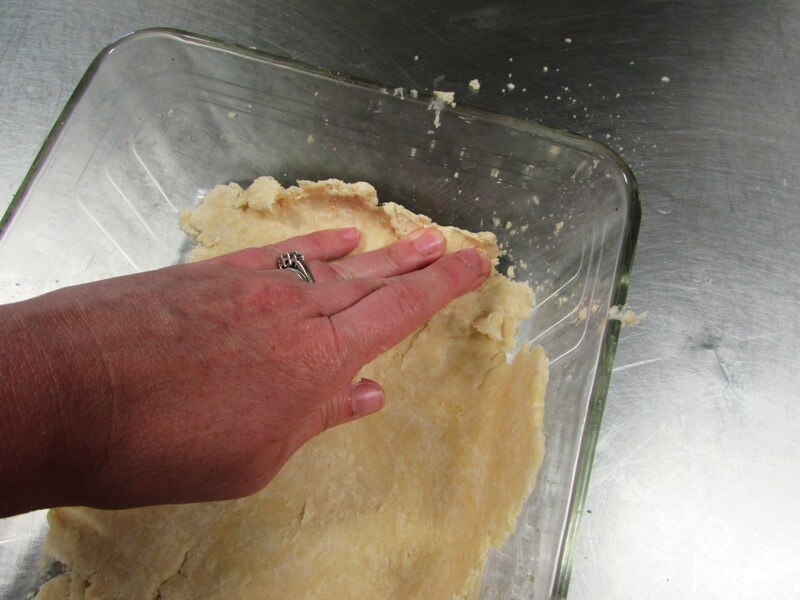 Blending can be done with a pastry cutter or a fork. I interchange them depending on which is clean at the time. See how it is beginning to come together? You want it to hold together without being sticky. The amount of water needed for this can vary day-to-day depending on humidity. Now lets make a ball! Well, 2 balls really. One for the bottom and one for the top. 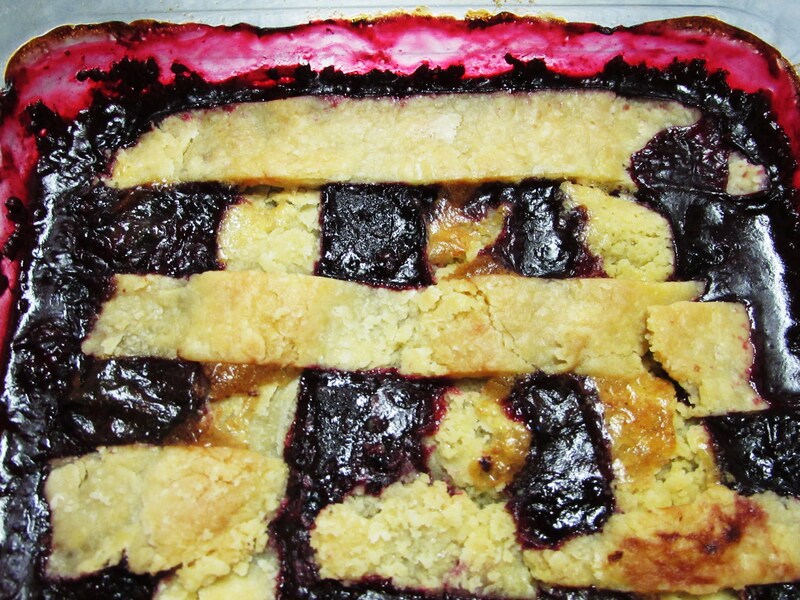 Sometimes I even make a little extra and do a layer of crust in the middle ’cause crust soaked in blackberry juice is one of my favorite things. Crust Ball! Sounds awful, doesn’t it? 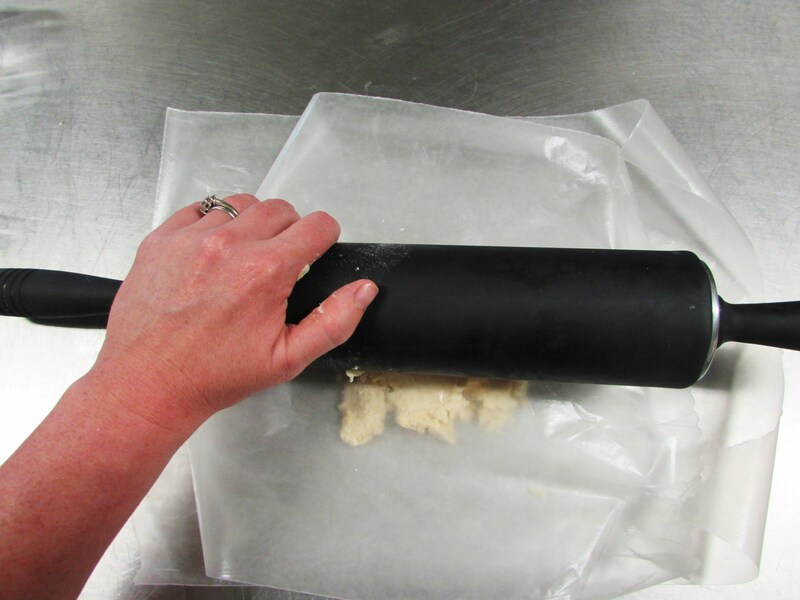 How we roll….we roll in wax paper. Roll until you think you have the right amount to cover the bottom of your dish. Test it out by setting it on top and seeing if the edges are far enough out. This should work. 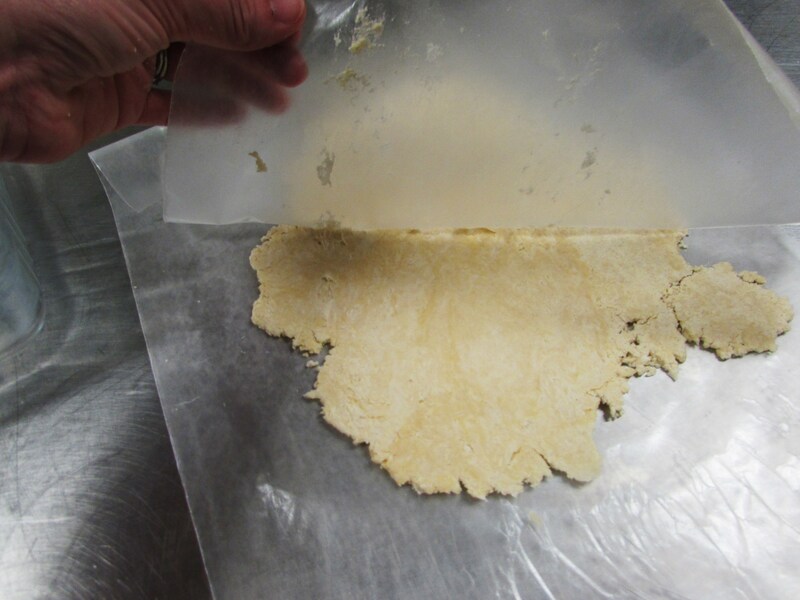 Peel off the top layer…..
and position the other layer over your dish, gently peel off the remaining wax paper. You see how the edges don’t quite cover the bottom? You fix this by smashing it around a bit with your fingertips. Now we are ready to attend to those berry beauties! I begin by smashing a few berries in the bottom for a little juice then heaping all its friends on top. Give’em some low heat and let’em starting simmering a bit. Smash and Stir. Smash and Stir. Real lemon juice and a bit of rind zest is better. I didn’t have a real lemon. I like nutmeg. This is optional. And I don’t measure it. I just sprinkle it. A nice non-measured dusting of nutmeg. 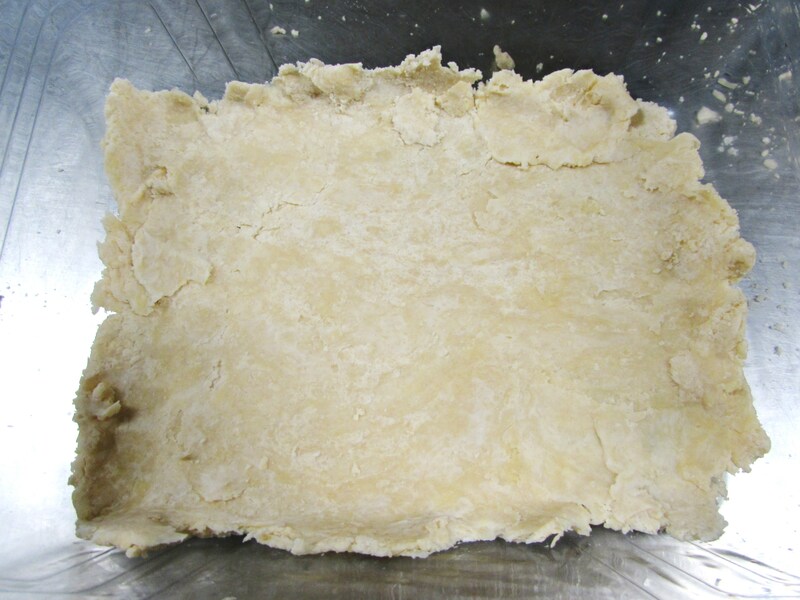 Once you reach this stage I like to let it simmer while I roll out the top crust and cut it into strips for lattice. 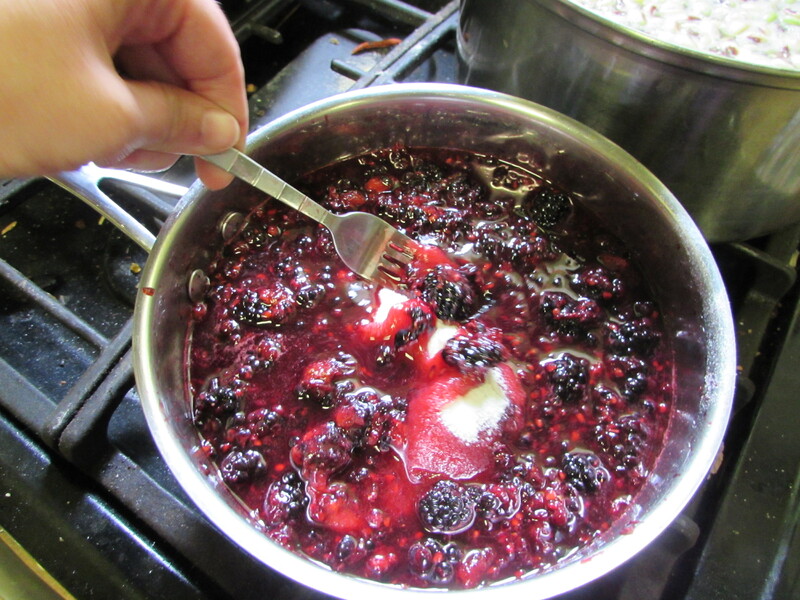 Then I pour the hot berry mixture carefully on top…. 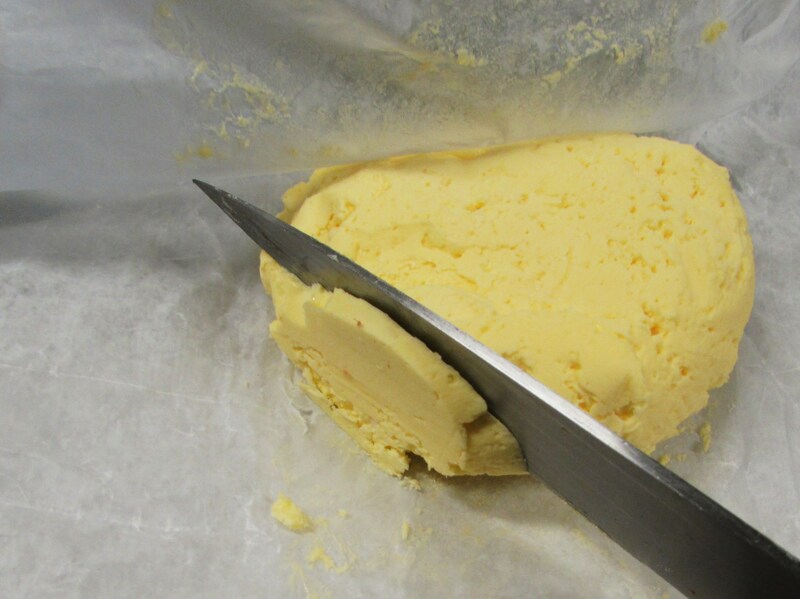 Now please go get some butter…. And apply it very liberally without any discretion whatsoever. Now you are ready to slap those little crust strips cross-ways on top! I like to slide them on a knife to prevent breaking. But if you break them, it really doesn’t matter. Just kinda piece it together. That is the beauty of cobbler. 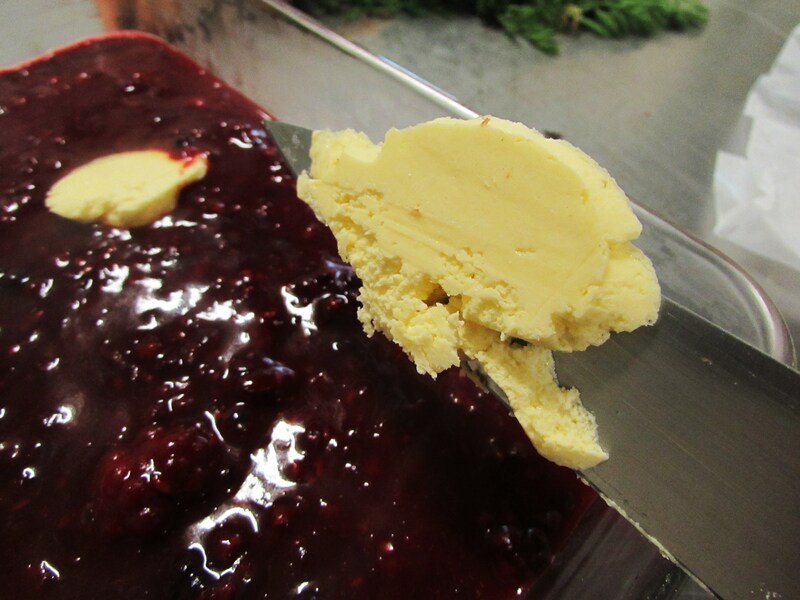 See how all that butter is beginning to melt and blend with the berry juices? Heaven. At this time please pop your cobbler into a nice hot oven, you can even sprinkle some white sugar on top. I forgot to do this. 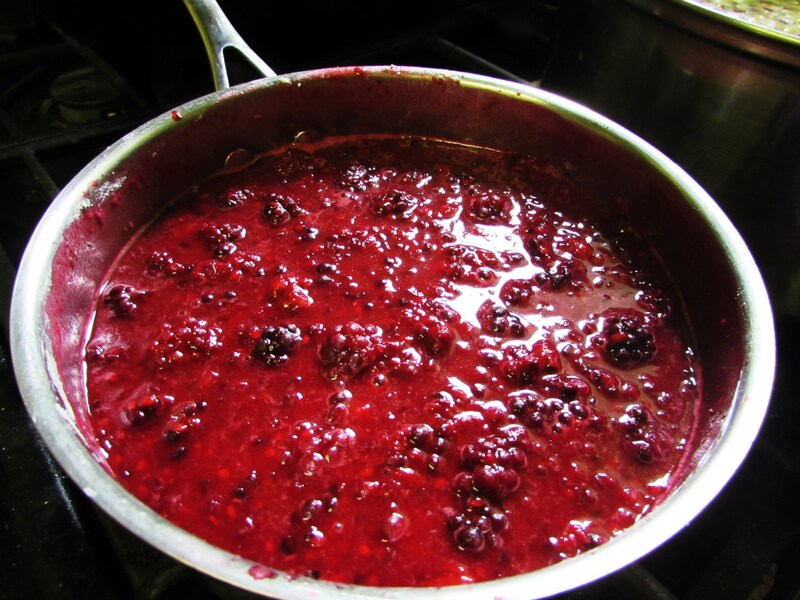 Next, find a small child and give them the now cooled off berry pan. Leave them alone for about 3 minutes. Then go take their photo. A few minutes more and……. Homemade cobbler. Crust and All. Please top with Vanilla BlueBell and share generously. 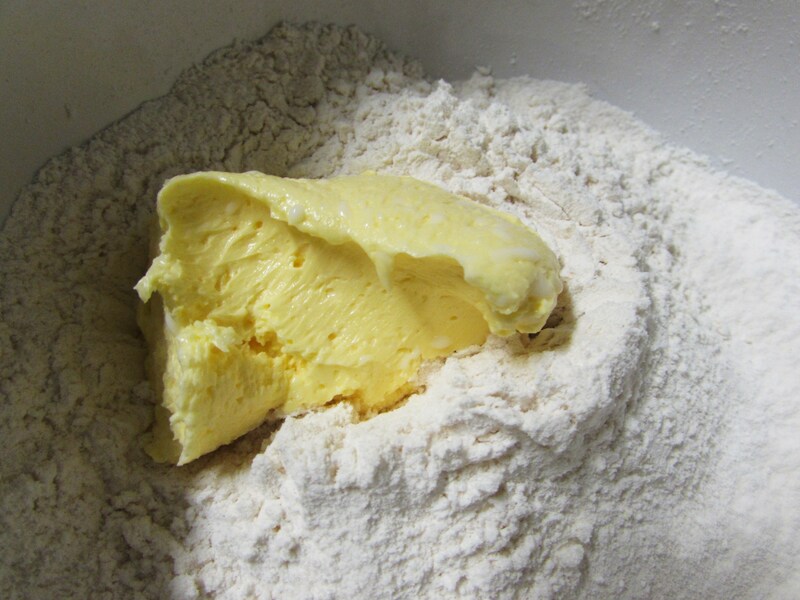 Mix flour and salt with pastry blender or fork. 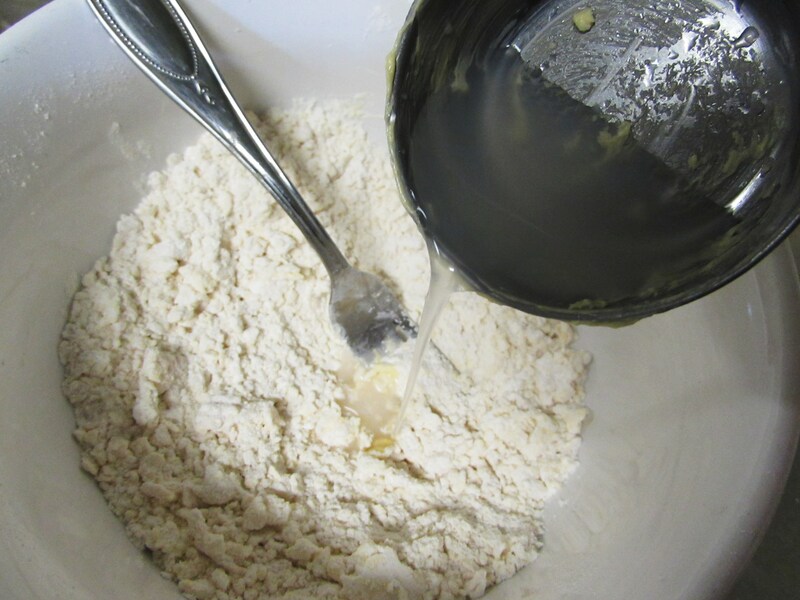 Add shortening and mix until crumbly then slowly add the water, 1 tablespoon at a time. 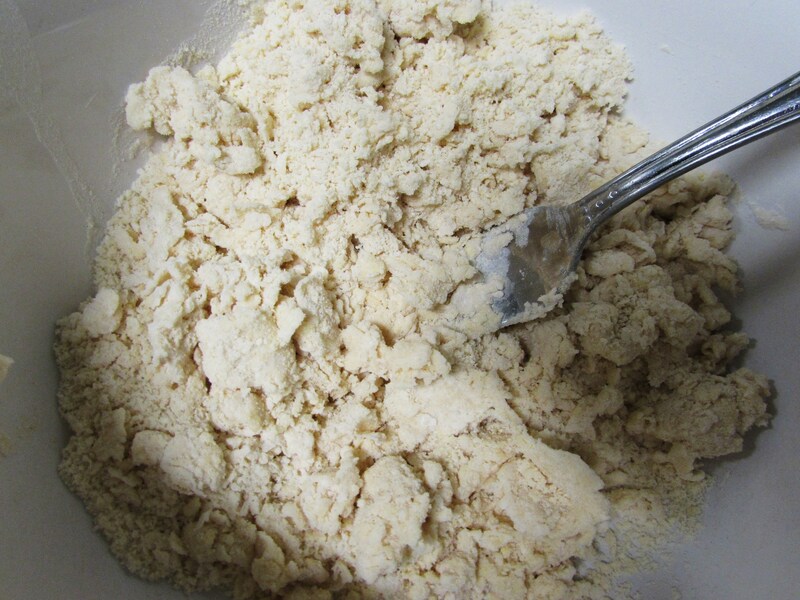 Take care to only mix the crust until it will hold together when pressed into a ball. Separate into 2 balls of even amounts. 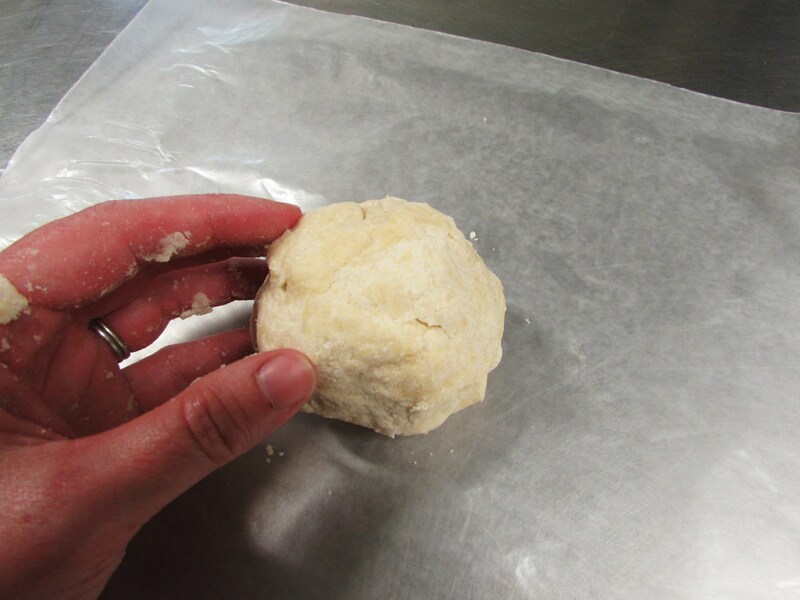 Cover 1 ball with a damp paper towel while you roll out the other ball. 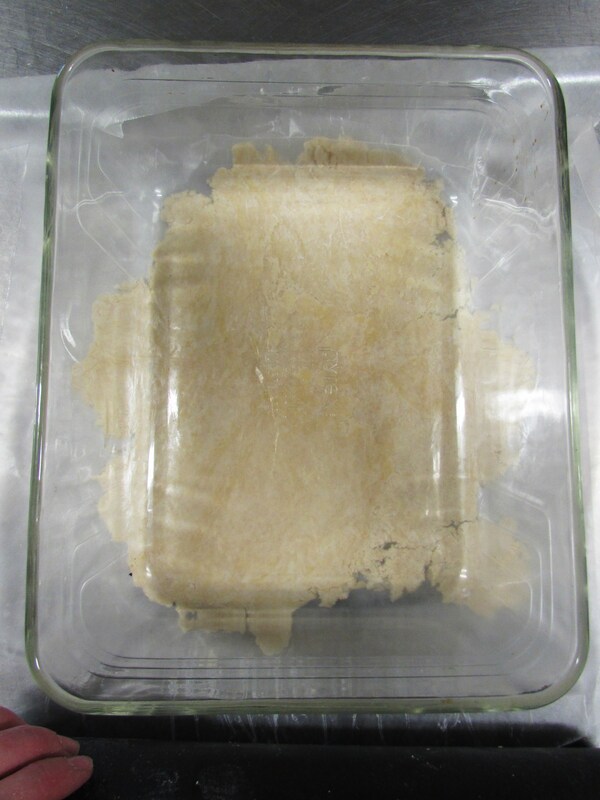 Using 2 sheets of wax paper roll out the first ball until it will cover the bottom of an 8 inch square Pyrex or baking dish of your choice. 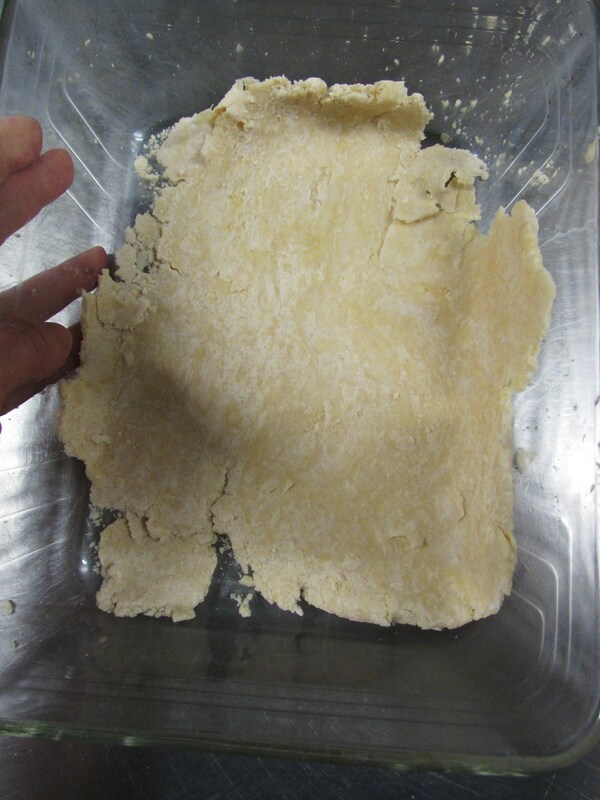 Carefully peel off the top sheet of wax paper and flip it, crust side down, onto the baking dish. 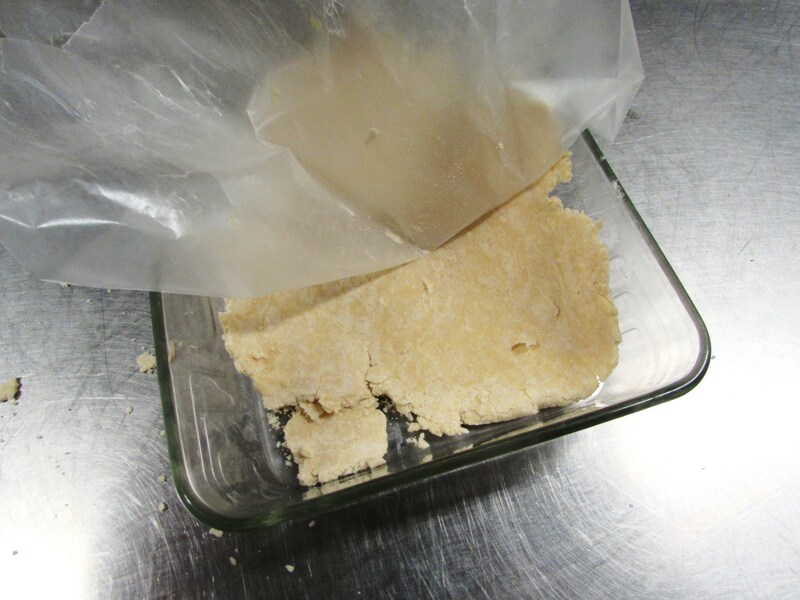 Carefully remove the other sheet of wax paper. 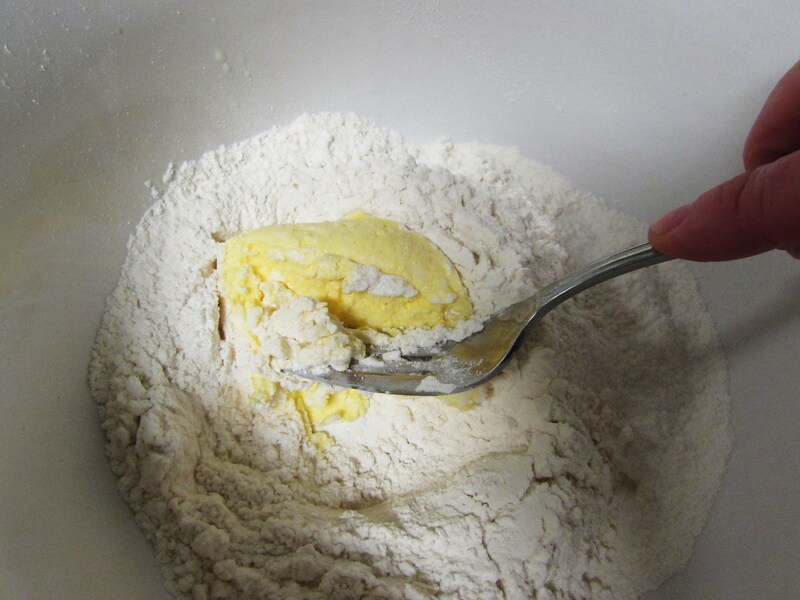 Set it aside and make the filling. 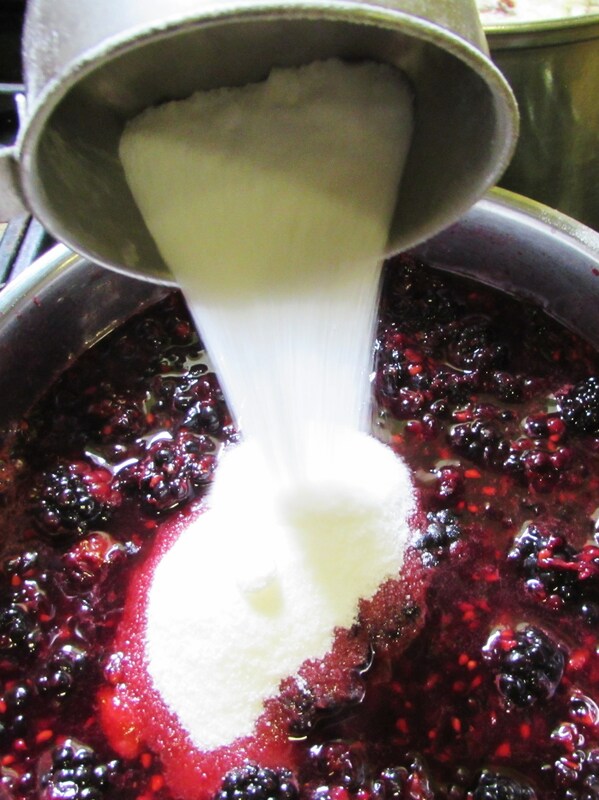 Place the berries in a large saucepan then crush a few in the bottom, add the sugar and flour. 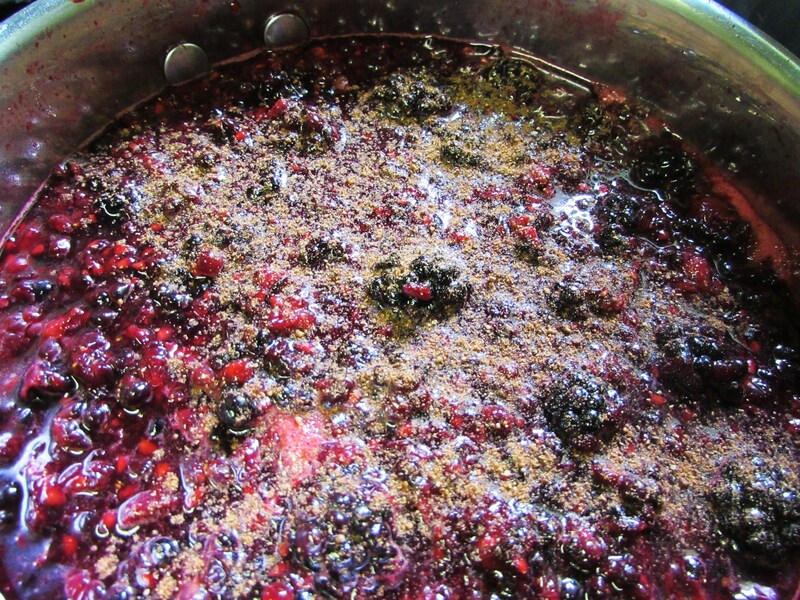 Cook over low-medium heat until the berries start to bubble and the juice begins to thicken. Add the lemon juice and nutmeg (if using). 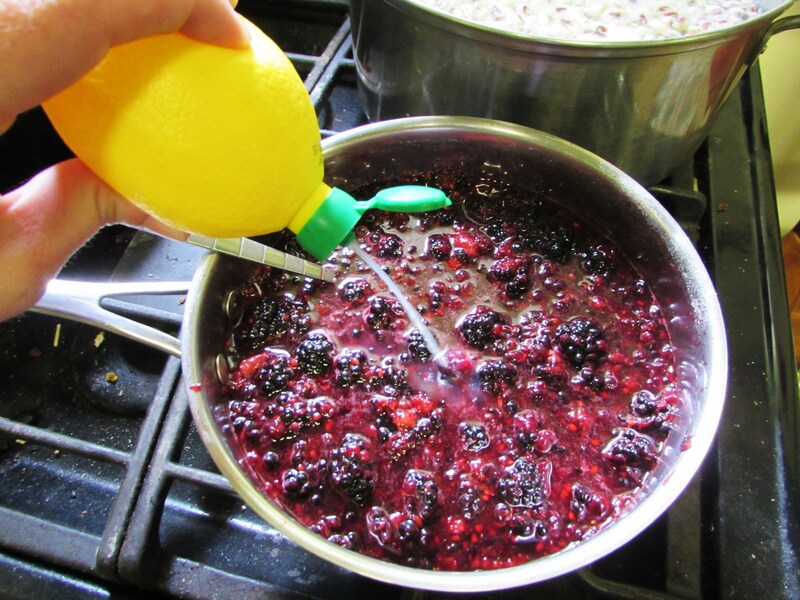 Turn heat to low and allow to simmer while you prepare the top. 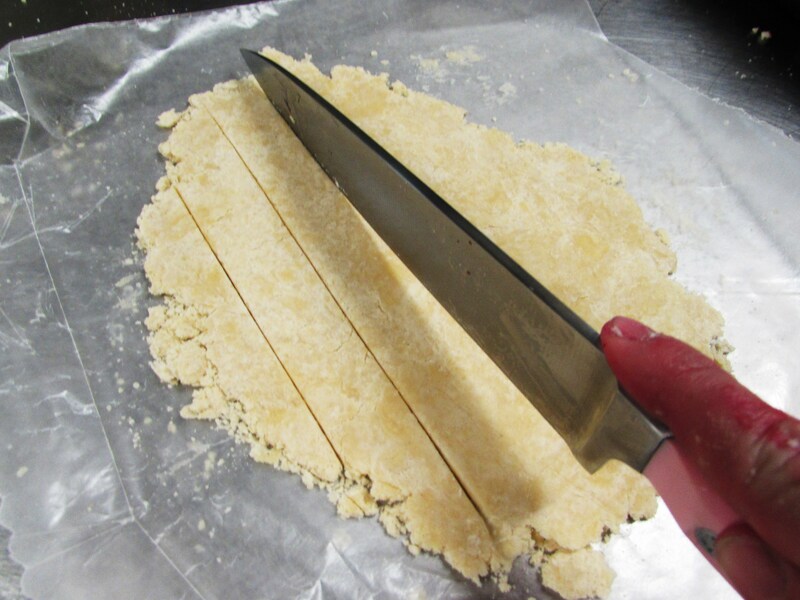 Roll out the remaining pie crust and cut into long strips. 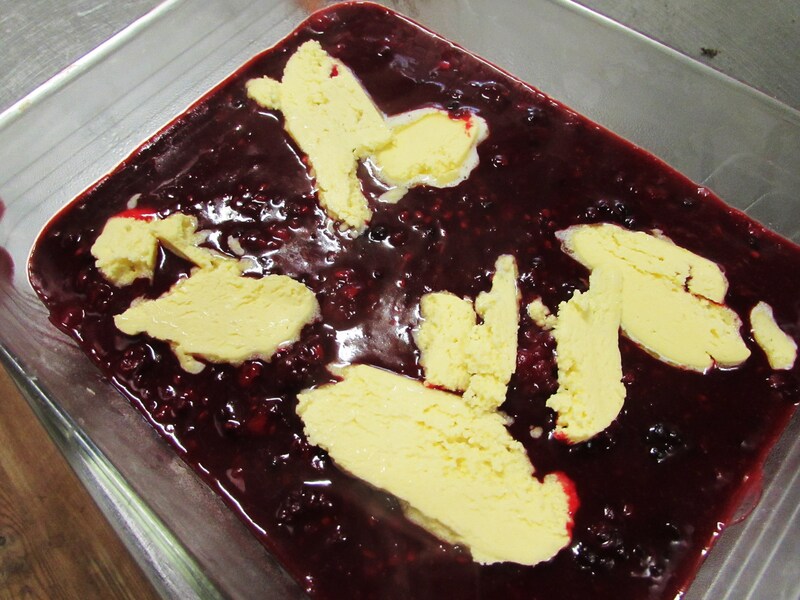 Pour the berry mixture into the baking dish and top generously with butter. 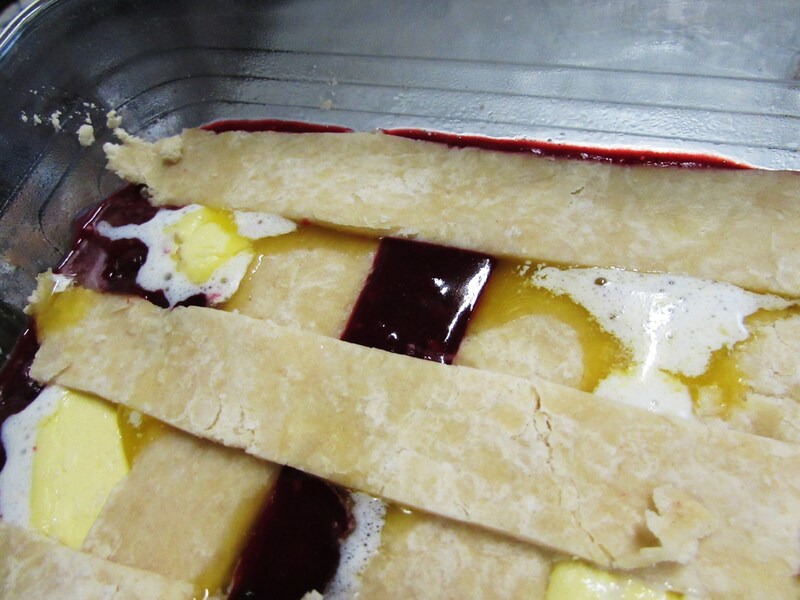 Carefully place the crust strips in a lattice pattern on top of the cobbler. 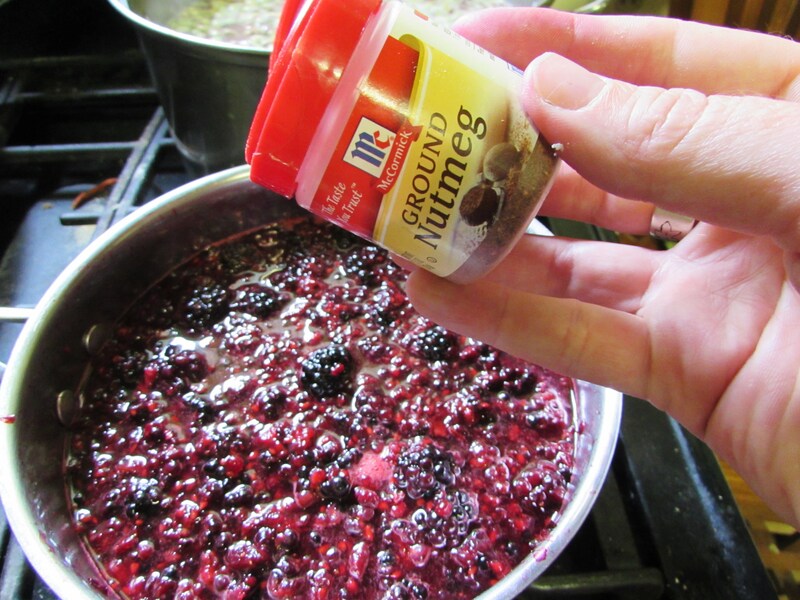 Sprinkle additional sugar on top if desired. Bake in a pre-heated oven at 350 for 1 hour or until golden on top. 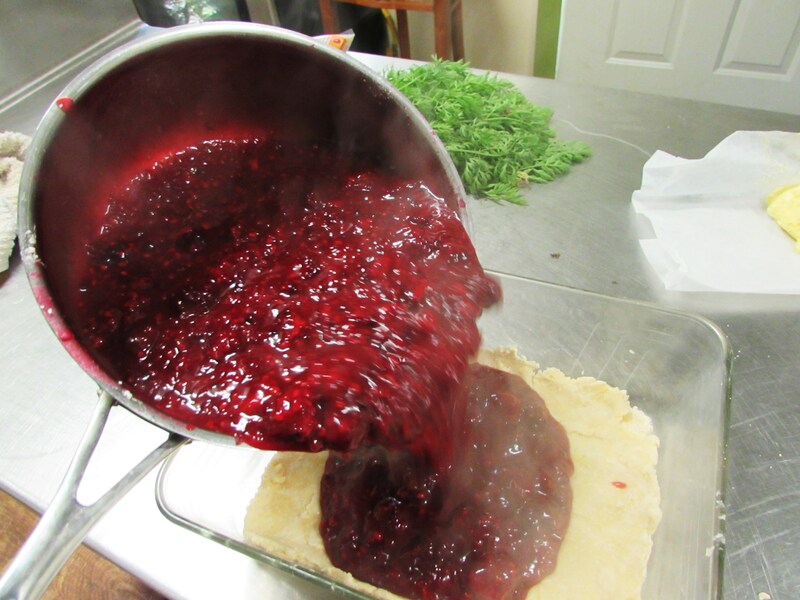 I hope you bring a black berry cobbler to the Sunday School Fish Fry…. Maybe you should bring 2!!! 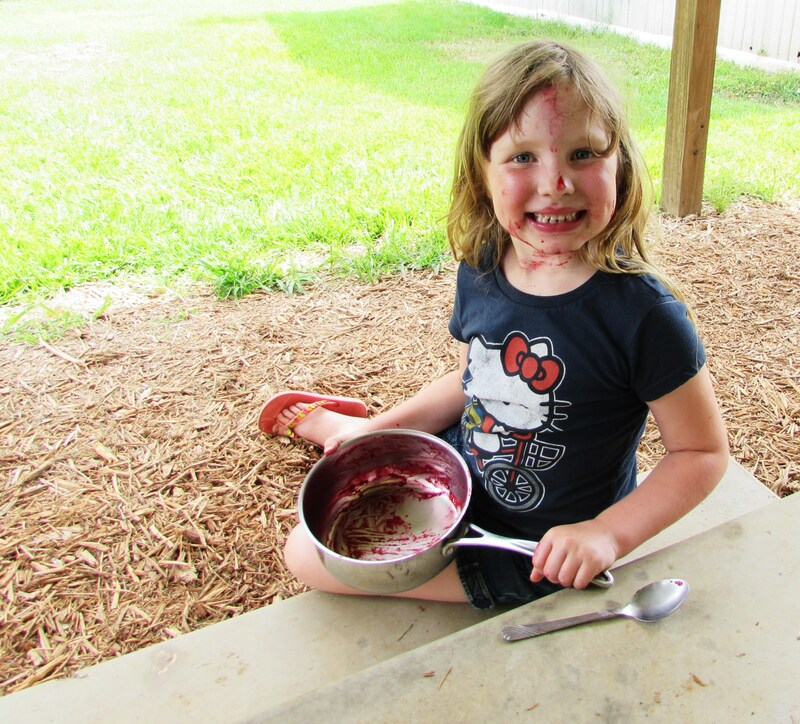 Berry cobbler is one of spring’s sweetest pleasures!